The day mortgage rate shoppers have been waiting for is finally here. After sitting out most of 2018, home buyers and refinancing homeowners are re-entering the market due to 14-month-low rates and favorable programs. Zero-down loans are prevalent, and new underwater refinance options have been unveiled by Fannie Mae and Freddie Mac. Has there been a better time to be shopping for a mortgage rate? Not in recent memory. But things might not stay this way for long. Will May bring unfavorable change to the market? May will be a wild ride for mortgage rates. Market-moving news will leave rates different than they were in April. The only question is, will they be more or less advantageous for mortgage shoppers? 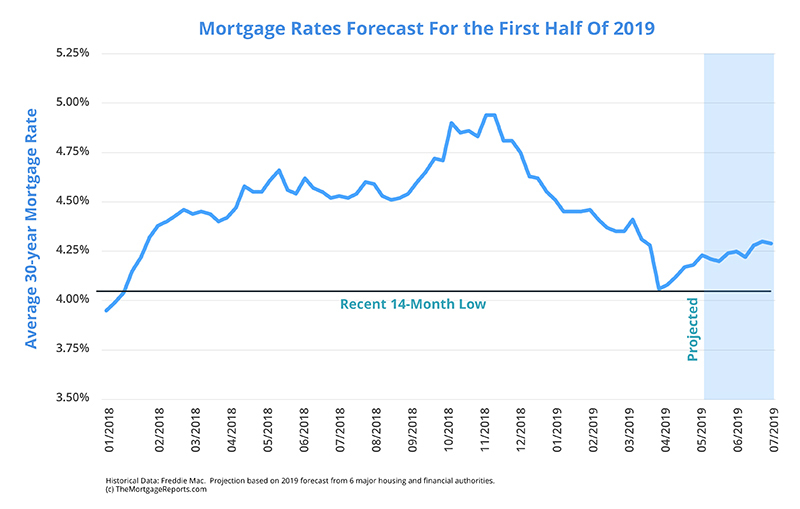 Forecasts for 2019 put rates somewhere around 4.6% by the end of the year. That’s down from rate forecasts earlier in the year that called for rates in the 5s. The funny thing is, though, that rates have been dropping since late 2018. Now, it appears rate increases could be much more subdued than first thought. Been looking for a good rate on a refinance or home purchase? Now might be the time to lock. Mortgage rates hit 14-month low. Will they stay rock-bottom? Mortgage rates recently hit a 63-week low and bottomed out near 4% as April began. It was the biggest drop in 10 years. But since then, mortgage rates have been inching upward. Some believe they were “oversold,” meaning they dropped too far, too fast. A correction is underway. Nevertheless, rates are still ridiculously low. Freddie Mac reports 30-year fixed rates hit 4.17% the week of April 18, 2019. This is a rate you could get a few months ago only by accepting a 15-year fixed or adjustable rate loan. Thirty-year fixed loans were close to the 5% mark as recently as November. There’s no way to say for sure. It seems most factors have been rate-favorable so far this year. But there is a good chance that rates could zoom up at any time. Mortgage rates tend to drift downward for months. No one notices. Then one day, rates rocket higher and everyone rushes to lock in. By then it’s too late. Rates tend to jump faster than they fall. The average consumer probably sees a similar but inverse path of the stock market. The Dow rises slowly over a period of months, then falls 1,000 points in a day. The rule of thumb is: Favorable conditions come slowly, unfavorable ones fast. If you’re thinking about a home purchase or refinance, don’t wait for lower rates. These may be the best rates we see this year. It’s obvious that mortgage rates are low. But “why” is the question that even experts are scratching their heads about. The stock market is once again approaching all-time highs, inflation is steady, and unemployment keeps hitting 40-50 year lows. But markets are always forward-looking. They are less concerned with what’s happening now than about what will happen in six, 12, or 18 months. Investors know there are serious concerns about the economy. The Fed: The March Federal Reserve meeting had a profound effect on rates. 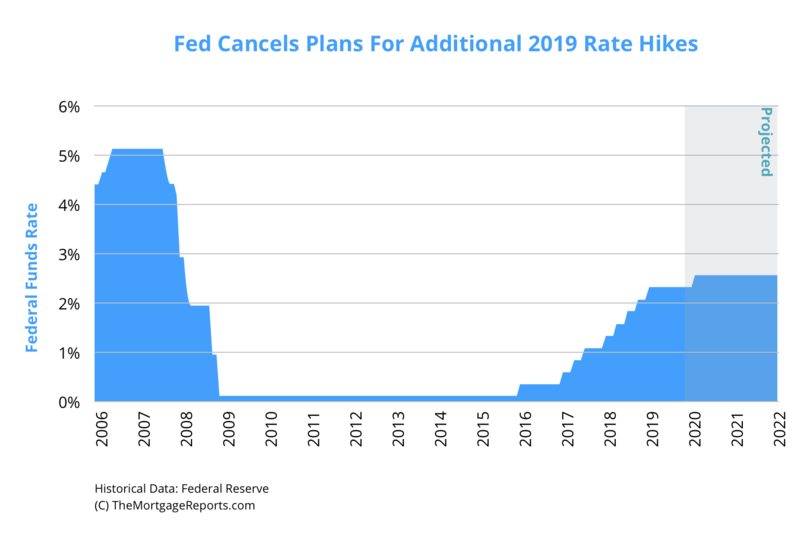 In its post-meeting announcement, the Fed revealed that it had canceled plans to raise rates in 2019. There were just too many concerns about the economy. Mortgage rates fell precipitously on the news. There’s another Fed meeting on April 30-May 1. Don’t expect major policy shifts at this meeting, but any Fed meeting can swing rates. Brexit: The world economy is a connected whole. So, investors in the US and abroad worry about Brexit’s impact worldwide. A recession in the UK could spread into Europe, then to all economies. This would help mortgage rates as investors seek safe assets, such as the bonds upon which mortgage rates are based. Inflation: Rising prices are bad for mortgage rates, for reasons described here. Fortunately for mortgage shoppers, inflation has cooled in 2019. These factors are dragging down rates, but major changes in any one of them could cause rates to start rising again. The Federal Reserve is not as confident in the future as it used to be. In December 2018, it raised rates, but backed off its forecast to hike rates three additional times in 2019. It predicted just two rate increases this year. Fast forward to the March meeting, where it completely scrapped plans to raise its benchmark rate at all. It cited “slower growth of household spending and business fixed investment in the first quarter” as well as “global economic and financial developments and muted inflation pressures” as reasons it was backtracking on its rate-hiking plans. This is the kind of sentiment that helps mortgage rates. The group meets again on April 30-May 1. The Mortgage Reports doesn’t expect major policy changes at this meeting. Still, it’s a good idea to watch for updates at 2:00 PM ET on May 1 when the Fed adjourns. Will rates continue to drop? It’s a possibility. However, according to Freddie Mac, rates are already at 14-month lows as of the time of this writing. Lower rates are becoming less likely. There’s a greater chance that rates will rise again soon. 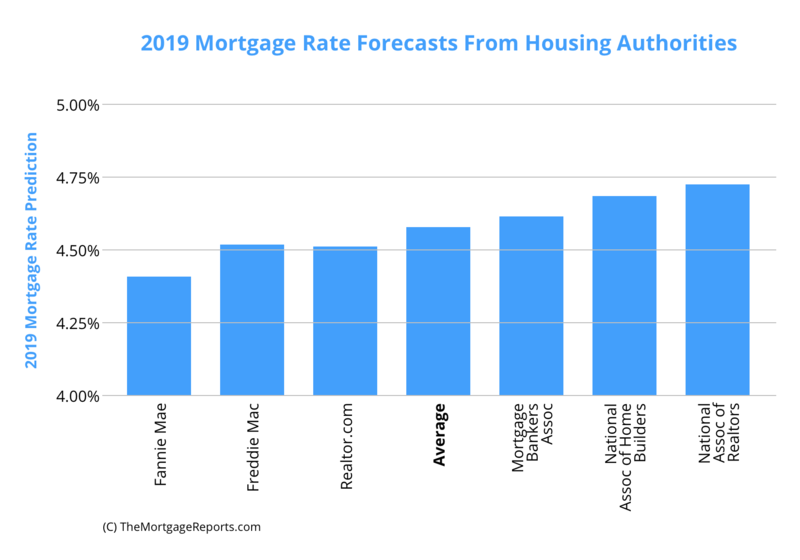 In the chart below, major housing authorities predict higher rates. If these agencies are correct, rates will start to climb soon, to reach the average predicted year-end rate of around 4.56%. Housing agencies nationwide are calling for rates in the low- to mid-5s for 2019. Only one agency is predicting a mild increase of 4.8 percent. To sum it up, everyone is predicting higher rates. Today’s rate might be as good as we’ll see for years to come. Knowing what will happen in May is only half the battle. As a mortgage rate shopper, you need to know the best actions to take this month. Refinance shoppers warmed the bench in 2018. Rates were too high for most homeowners to benefit. Unless they needed a huge amount of cash via a cash-out refinance, they didn’t touch their 4% mortgage. But a window of opportunity is opening again. As of the time of this writing, mortgage rates were as low as they were in January 2018 according to housing agency Freddie Mac. Thirty-year mortgage rates averaged just 4.17 percent for the week of April 18, 2019. Mortgage rates are down 60 basis points (0.60%) since their November highs. That’s a savings of more than $100 per month on a $300,000 loan. If rates keep dropping, refinance shoppers may be enticed to pull the trigger. That’s especially true for those getting into a 15-year loan or turning their home equity into cash via a cash-out refinance. Still others may refinance to cancel their PMI or because their credit has improved. Another option has surfaced: the Freddie Mac Enhanced Relief Refinance, or FMERR. This loan allows homeowners to refinance into today’s lower rates even if they are underwater on their mortgage. A similar program, the High LTV Refinance Option permits refinances for underwater homeowners whose current loans are owned by Fannie Mae. How low do rates have to go before you consider a refinance? It depends on your current rate, of course. But, if you can save $100 per month or more, it’s worth looking into. Because rates rose in 2018, lenders are desperate. Mortgage refinance applications are still down big compared to a few years ago, according to the Mortgage Bankers Association. For this reason, home purchase and refinance applicants should try and try again if they get denied. Remember: shopping for a mortgage is like shopping for anything else. There are hundreds of sources from which you can buy. If you are denied, try again. Mortgage companies are likely to stir up business by loosening guidelines in 2019. Higher debt-to-income ratios and lower credit scores may be allowed. Many mortgage shoppers don’t realize there are many different types of mortgage rates. But this knowledge can help home buyers and refinancing households find the best value for their situation. Following are updates for specific loan types and their corresponding rates. Conventional refinance rates and those for home purchases are still low despite recent increases. According to loan software company Ellie Mae, the 30-year mortgage rate averaged 4.79% in March. This is higher than Freddie Mac’s 4.17% average because it factors in low credit and low-down-payment conventional loan closings, which tend to come with higher rates. Additionally, the most recent Ellie Mae report shows rate levels before they started dropping. Lower credit score borrowers can use conventional loans, but these loans are more suited for those with decent credit and at least 3% down. Five percent down is preferable due to higher rates that come with lower down payments. Twenty percent of equity is preferred when refinancing. With adequate equity in the home, a conventional refinance can pay off any loan type. 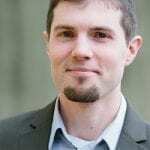 Got an Alt-A, subprime, or high-PMI loan? A conventional refi can take care of it. For instance, say you purchased a home three years ago with an FHA loan at 3.5% down. Since then, home values have skyrocketed. You refinance into a conventional loan (because you now have 20% equity) and eliminate FHA mortgage insurance. This could be a savings of hundreds of dollars per month, even if your interest rate goes up. Getting rid of mortgage insurance is a big deal. This mortgage calculator with PMI estimates your current mortgage insurance cost. Enter 20% down to see your new payment without PMI. FHA is currently the go-to program for home buyers who may not qualify for conventional loans. The good news is that you will get a similar rate — or even lower one — with an FHA loan than you will with conventional. Related: Read more about FHA costs and requirements on our FHA loan calculator page. According to loan software company Ellie Mae, which processes more than 3 million loans per year, FHA loan rates averaged 4.83% in March, while conventional loans averaged 4.79%. Another interesting stat from Ellie Mae: About 30% of all FHA loans are issued to applicants with scores below 650. FHA loans come with mortgage insurance. But the overall cost is not much more than for conventional loans. A little-known program, called the FHA streamline refinance, lets you convert your current FHA loan into a new one at a lower rate if rates are now lower. An FHA streamline requires no W2s, pay stubs, or tax returns. And you don’t need an appraisal, so home value doesn’t matter. Learn more about the FHA streamline refinance here. Homeowners with a VA loan currently are eligible for the ever-popular VA streamline refinance. No income, asset, or appraisal documentation is required. If you’ve experienced a loss of income or diminished savings, a VA streamline can get you into a lower rate and better financial situation. This is true even when you wouldn’t qualify for a standard refinance. But don’t overlook the VA loan for home buying. It requires zero down payment. That means if you have the cash for closing costs, or can get them paid for by the seller, you can buy a home without raising any additional funds. Don’t overlook the VA loan for home buying. It requires zero down payment. VA mortgages are offered by local and national lenders, not by the government directly. This public-private partnership offers consumers the best of both worlds: strong government backing and the convenience and speed of a private company. Most lenders will accept scores down to 620, or even lower. Plus, you don’t pay high interest rates for low scores. Check your monthly payment with this VA loan calculator. There’s incredible value in VA loans. Like FHA and VA, current USDA loan holders can refinance via a “streamlined” process. With the USDA streamline refinance, you don’t need a new appraisal. You don’t even have to qualify using your current income. The lender will only make sure that you are still within USDA income limits. More about the USDA streamline refinance. Home buyers are also learning the benefits of the USDA loan program for home buying. No down payment is required, and rates are ultra-low. Home payments can be even lower than rent payments, as this USDA loan calculator shows. Qualification is easier because the government wants to spur homeownership in rural areas. Home buyers might qualify even if they’ve been turned down for another loan type in the past. While a monthly mortgage rate forecast is helpful, it’s important to know that rates change daily. You might get 4.3% today, and 4.4% tomorrow. Many factors alter the direction of current mortgage rates. To get a synopsis of what’s happening today, visit our daily rate update. You will find live rates and lock recommendations. The next thirty days hold no shortage of market-moving news. In general, news that points to a strengthening economy could mean higher rates, while bad news can make rates drop. Now could be the time to lock in a rate in case these events push up rates this month. Low mortgage rates are still available. You can get a rate quote within minutes with just a few simple steps to start.